If you love rides and want to save money, we recommend our admission-and-ride packages! You can save up to 50 percent of what you’d pay at the window. These packages are on sale now! Our best package; offered exclusively at your local San Diego Costco Wholesale Warehouse. Save 23% with this package. Save 33% with this package. Save 36% with this package. One ticket with 25 credits toward rides and games. Sold through May 30; not available after that. Until the Fair begins, Value Pack, Ride Fanatic Pack, and Ride & Game Ticket are sold through Ticketmaster and the Fair Box Office. Listed prices do not include Ticketmaster fees. The Costco Pack is sold only at Costco locations, starting about the first of May, through July 3. 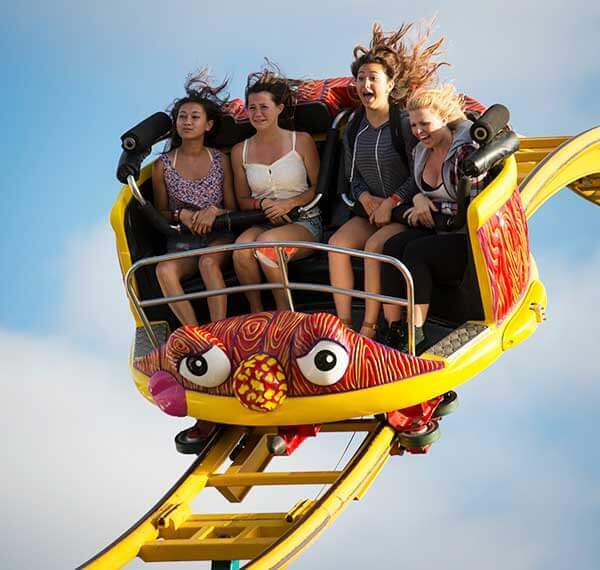 Once the Fair has opened (May 31, 2019), Value Pack and Ride Fanatic Pack must be purchased through Ticketmaster. They are not sold at the Box Office during the Fair. Rides and games require multiple credits. The number varies, depending on the ride or game. Please see the Rides section for more information. Get in touch with our Box Office or call (858) 792-4252.